Any Professional who has access to a Group will automatically have access to all athletes in subgroups under that parent group. Before you Add a new Group you MUST review your athletes grouping structure. An example of a "Tree" structure is shown here but you may have 3-4 different "Tree" grouping structures. Before you create and set up your groups, you MUST consider how your athlete's are currently grouped and you need to consider groups based on which professionals need to access which group/s of athletes, and to meet your data analysis needs. The most critical step that you need to do RIGHT NOW is to get a blank piece of paper so that you can draw down the different groups of athletes. Take some time to write down your grouping structure and make sure you write in if there is a Main groups of athletes, and then which groups needs to be set up as subgroups. Each group can only have one parent group, so if you are creating separate grouping structures, you need to draw them and then add in the athletes into the lowest groups (e.g. the subgroups). If you have different breakdowns of groups for coaches that only work with one athlete, or that work with a specific sport (e.g. cycling), or with a specific classification of athlete then consider creating separate grouping structures. These can easily be set up under a main "Coaching" group or "Classification" Group, with all of the smaller coaching groups being set up as subgroups. The individual coaches would have access to their own group, and an administrator could access the main group. If in doubt, think about the "Tree" structure and set up your groups accordingly. You can have multiple grouping structures, but we urge you to draw each of them first on a piece of paper as separate groups. Remember also that you will need to maintain these groups over time, so think carefully. 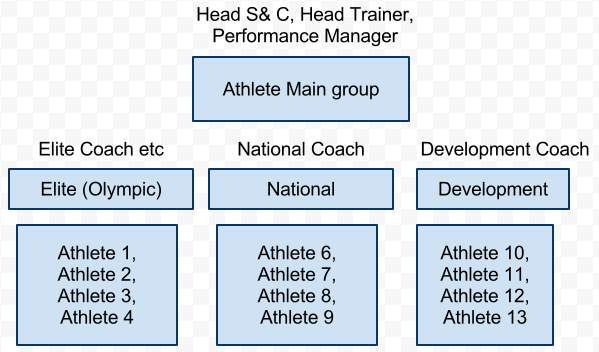 The grouping structure shown here shows that Athlete Main Group needs to be set as a group, and the Elite, National, Development groups would be set up as subgroups under that group. In this example, there would actually be NO athletes in the"Athlete Main group", as the athlete names would be entered into the subgroups. However, these athletes are shown on the system when viewing the Athlete Main grouping. N.B subgroups are set up the same as a creating a new group is created, but they are simply added in as subgroup as an existing group. Why are Groups Important? They are critical to set up for Access and for Analysis. You need to set up groups based around the access that each different type of professional may need. You also need to ensure your analysts or professionals have the correct grouping structures to performance analysis on the correct groups of athletes. Talk to the different Professional who are building this site and double check that you are setting up the correct groups and subgroups based on what your organisation/sport needs.